According to this post on Exxon Mobil's Perspective Blog , "For every gallon of gasoline, diesel or finished products we manufactured and sold in the United States in the last three months of 2010, we earned a little more than 2 cents per gallon. That’s not a typo. Two cents." Update: ExxonMobil is now reporting that for its retail gasoline operations in the U.S., it made an average profit of 7 cents per gallon during the first quarter of 2011. This is a reminder that out national prosperity comes from private enterprises, and not parasitic federal civilian and military agencies. arent most gas taxes used for highway maintenance? should we instead make all roads toll roads? I'm not disputing the data. However, my question is why wouldn't a 25% increase in price per barrel of oil directly translate into a massive increase in their net profit margin? Exxon is currently around $400B revenue. They say they get 8% net profit, or $32B. Increase price per barrel by 25% - they now get $500B. We wouldn't expect costs to change (if they do change, the change is minimal). Net profit should now be $100B minus 40% taxes, or $60B increase. Total net profit will now be at $92B, or 18.4%. Why doesn't this happen, especially in light of the 50%+ increase in price per barrel? Most likely because Exxon hedges their oil price exposure in futures markets. In the meantime, we are transferring trillions of dollars to OPEC. Ridiculous. Prof J could be right, but I think the explanation is likely simpler, and semantic in nature. The source blog specifically frames the profit margin discussed as coming from "... every gallon of gasoline, diesel or finished products we manufactured and sold..." (emphasis mine). So they're only talking about product they have refined, which actually could be negatively impacted by the high prices, depending on where they get it and how they do their accounting. It specifically seems to discount any increased profits they might see from oil sales themselves, however. ""In the meantime, we are transferring trillions of dollars to OPEC. Ridiculous." Who is "we" in your comment? Is transferring really the best word to use? Isn't that money being exchanged for something valued more highly than the money? "Exxon is currently around $400B revenue. They say they get 8% net profit, or $32B. Increase price per barrel by 25% - they now get $500B. We wouldn't expect costs to change (if they do change, the change is minimal). Net profit should now be $100B minus 40% taxes, or $60B increase. Total net profit will now be at $92B, or 18.4%." You are conflating barrels of oil, an input to their business, with gallons of gasoline, their final product. There's no direct connection between the price of crude oil and the profit margin Exxon makes on the finished product. If you consider a net profit of 8%, then 92% of their revenue from selling finished product must be what it cost them to produce it, including the cost of the crude oil. I don't know what portion of that production cost is the oil itself, perhaps you know what it is, but a 25% increase in the price of this raw input wouldn't necessarily affect their profit margin at all, although it will doubtless affect the price of gas at some point. Oil is a global commodity, that is bought and sold on international markets, so although Exxon is an oil producer, it might be easier to picture the process if you think of them buying all the oil they use from the global market. Follow the "Exxon Mobil's Perspective Blog" link in the original post for a much better explanation than mine. I'm thinking those gas stations on the Jersey side of the Holland tunnel get alot of NYC business. Stephen: "why wouldn't a 25% increase in price per barrel of oil directly translate into a massive increase in their net profit margin?" The simple answer is that Exxon does not own all the oil which they produce and refine. The figure I've seen is that Exxon owns only 3 percent of the world's proved reserves. ("Proved reserves", not "proven reserves", is the historical industry term.) I'm pretty sure that Exxon's global production and refining share is much larger than 3 percent, though I cannot quickly find figures for those operations. Stephen: "We wouldn't expect costs to change (if they do change, the change is minimal)." I'm not so sure that is correct. ased on every thing I've read, the cost to explore, find, and develop oil is getting much more expensive. In fact, the economics of oil are such that an increase in the price of oil leads to the development of marginally expensive oil fields. As oil prices increase we should expect exactly that oil exploration and production costs will rise. Exxon is an integrated energy company. Petroleum production is only one of the industries in which it operates. It is possible that costs in Exxon's other businesses - refining, chemicals, and natural gas - have increased significantly. "However, my question is why wouldn't a 25% increase in price per barrel of oil directly translate into a massive increase in their net profit margin?" one thing to keep in mind is that the US government is not the only agency taxing exxon. the foreign governments that own the oil fields do so as well, usually on a % of oil price basis. this is why exxon pays a higher tax rate that any other company in the S+P 500.
in 2010, XOM had 370bn in operating revenues. they spent 197 buying crude oil. this leaves 173 bn in revs net of oil costs. add in their other costs and you wind up with 52.9bn in pretax earnings. this rate goes up when the price of oil does. so do exploration costs etc as they seek more oil. under such a tax regime (relative to pretax profit they are paying a 73% tax rate) it is virtually impossible for to get much leverage, especially in a business as competitive as oil. If not for Pennsylvania's 50.7 cent-per-gallon gasoline tax, we'd have the consensus worst roads in the United States. Oh. Wait. We do have the consensus worst roads in the United States. I now see from the link Mark provided that Exxon owns only 1 percent of the world's oil reserves, but produces 3 percent of the crude. That link also shows that Exxon buys more crude than it produces. So it is other entities - not Exxon - which realizes the gain from crude oil price increases. As Prof J points out, Exxon hedges its oil price exposure. That means that it has sold the rights to crude oil price increases in exchange for protecting itself from crude oil price reductions. I'm not defending Pennsyvania's highway department, but I do know that road building and maintenance costs vary significantly across the nation. For example, highways in Arizona are not exposed to the environmental damage of roads in Louisiana, which traverse marshes and which suffer potholes from excessive ground moisture. Tony C: Good point. Any of those red states that border a blue state must see a lot outbound gas customers who live near the border. aorod: "In the meantime, we are transferring trillions of dollars to OPEC. Ridiculous." First, Ron H is correct. U.S. refiners are not transferring money. They are paying about $178 billion annually to OPEC for an input which they transform into a more valuable good. Second, those refiners are paying North American owners of crude oil much more than they are paying OPEC. Finally, I doubt that OPEC is realizing all of the gains from crude oil price increases. Like Exxon, they probably hedge their exposure to crude oil price changes. Speculators have likely realized much of the increased profits from American purchases of crude oil. "Speculators have likely realized much of the increased profits from American purchases of crude oil." you are making the presumption that the only way to hedge is to trade with "speculators". most of the hedging is done with futures contracts. the main buyers of futures are consumers of oil like refiners, airlines, trucking companies, those who make petrochemicals and plastics etc. they are just locking in future prices. when they get good deals, the tend to pass the savings on. recall how virgin america used this tactic to under-price jet blue etc on some key US longhaul routes and take share (to the benefit of consumers). you are also presuming that OPEC hedges a great deal of its output more than a couple of months into the future, a claim i do not think is accurate. do you have any data on that? depending on where they get it and how they do their accounting. I wondered about that, too. How is their retal business defined? They could be making a lot more on the wholesale side. morganovich: "you are making the presumption that the only way to hedge is to trade with "speculators"." No, I am not. I never said anything of the sort. "The CFTC, which learned about the nature of Vitol's activities only after making an unusual request for data from the firm, now reports that financial firms speculating for their clients or for themselves account for about 81 percent of the oil contracts on NYMEX,"
So, what I will assume is that the chances of a hedger trading with an oil speculator may be as much as 81%. morganovich: "you are also presuming that OPEC hedges a great deal of its output more than a couple of months into the future"
I do not know if OPEC nations hedge their exposure to future prices. But I do know that most publicly traded energy companies have hedged their exposure in the past. A couple of years ago, Deutsche Bank reported that the oil and gas companies it follows had, in total, hedged about 45% of expected oil production for the upcoming 12 months. When I posted my earlier comment I assumed that OPEC producers would act in a similar fashion as American producers. However, I have since read that Muslim may inhibit the practice of hedging. If OPEC producers are not required to reveal their financial transactions in the same way that American publicly traded companies are, I don't think we can really know the extent to which they are hedging. morganovich: "you are making the presumption that the only way to hedge is to trade with 'speculators'." Please do not twist my words. I said that speculators LIKELY realized the profits from increased oil prices. That's because speculators hold most of the oil futures contracts. "The Commodity Futures Trading Commission said financial firms speculating for their clients, or for themselves, accounted for about 81% of the oil contracts on the New York Mercantile Exchange"
Although airlines, refiners, ands other energy consumers do hedge in the futures markets, the probability is that the other side of one's contract is a speculator. That's because speculators hold most of the oil futures contracts. but those contracts cover only a small part of the oil market. most future delivery contracts are not exchange traded. most are deals like "exxon will deliver x bbls of oil to dupont at such and such a time for P price"
you are looking at the tail and mistaking it for the dog. also note that a 45% hedge rate for the majors does not imply futures contracts. the xom dupont deal i described above also counts as hedging. Your headline says "42 cents"...shouldn't that be "48 cents?" Thanks Jim, the headline is fixed now. 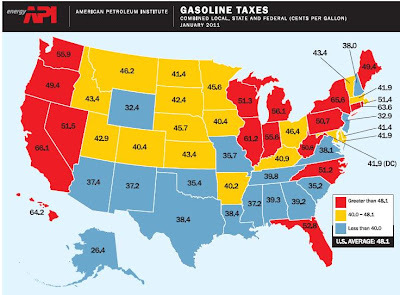 FWIW, most states put the vast majority of of their state's gas tax revenue into their "General Fund". Much of the revenue also goes for mass transits, bike paths, even manicuring the landscaping on traffic islands. I appreciate this discussion. Like most headlines, the startling fact obfuscates the actual substance of the report or news story. Thankfully, there are a number of erudite posts here that cite helpful, factual sources. Here is a link from the U.S. Energy Information Administration that provides a clear summary of where our proceeds go from the sale of a gallon of gasoline at the pump. Juxtaposing ExxonMobil profits with gas taxes may make you think that the poor old oil company isn't making a fair profit. Taxes amount to 12% of the price at the pump. Marketing costs account for 7%, refining 13% and crude 68%. Randall, you may want to look at the explanation page on the site you referenced. Your comments seem to suggest that "taxes" to the oil companies amount to an average of only 12% Actually, those are state and federal excise taxes that we, as consumers, pay at the pump. 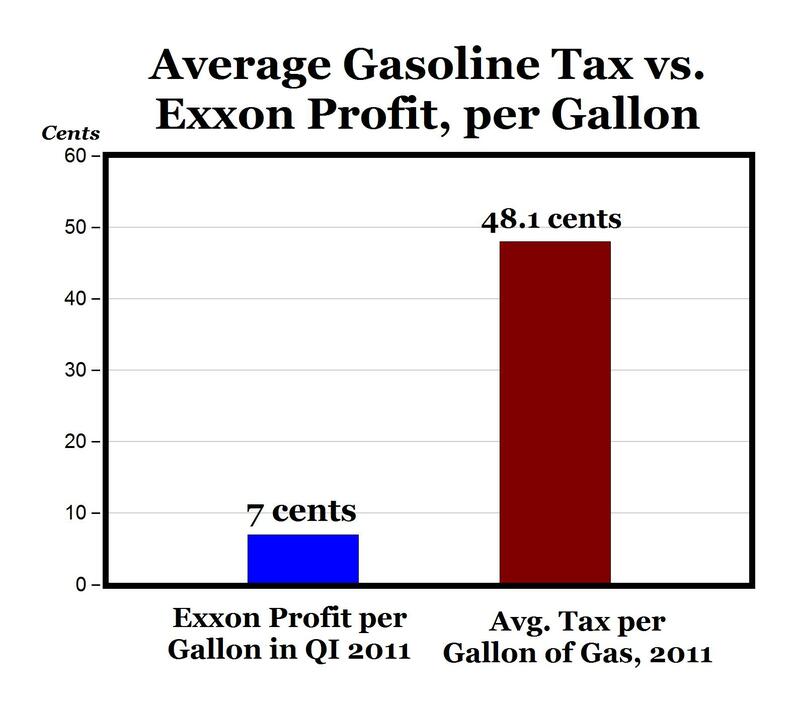 The "profits" to the oil companies are built into some of the other percentages and it's not clear from the charts exactly what the profit margins are. You'd have to get that from other sources. Rules of Gramar: Insterments of White Opresion?